Just to be clear, we are referring to the beautiful Felicia convertible produced from 1959 to 1964 at the Mlada Boleslav Factory, home of the Czech manufacturer since the 40s. Originally powered by a 1089cc (994 model) in line four, it offered 53bhp according to the period brochure, ample for your average ‘sportsman of character’. 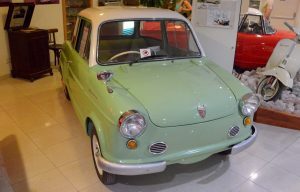 Although much was lost in translation the RHD version would represent the Skoda brand with its first venture onto the UK market. 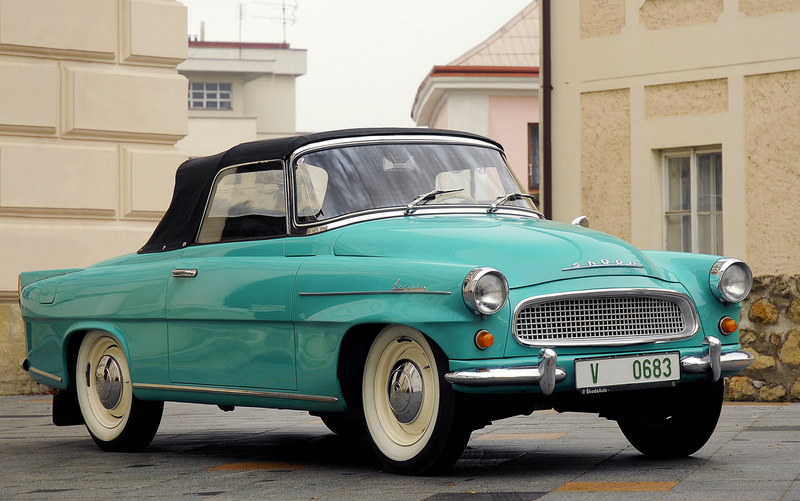 Behind the Iron Curtain the Felicia was as desirable as Eastern Block transport could be whilst in the UK sales were mediocre despite an £800 price tag. The motor was increased in 1961 and the 1221cc (Super 996) added another 2bhp, the same brochure boasted 88mph through a four speed gearbox minus synchro in 1st. It also enjoyed a basic all round independent suspension with coil spring front and leaf spring rear, stopped by drum brakes which were more than adequate to cope with its 865kg bulk. Just under 15k were produced in total and all enjoyed the wide panoramic screen with four seat comfort on plastic upholstery. Electric wipers and ignition key starting may seem the norm nearly sixty years later but were features worth mentioning back in the day. Even the hardtop option didn’t ruin the elegant styling thus ‘the man of success who knew his aim’ could revel in this Skoda with grace that I would love to ride in today; or at least hear from CMM readers that can offer a memory or two. The NSU name originated well over a century ago with bicycle production leading to motorcycles and their first cars around 1906. Small cars of low performance became the norm through to WW1 then continued during the inter-war years until 1929 when NSU sold its car factory at Heilbronn in Southern Germany to Fiat. NSU retained its Neckarsulm Werks for motorcycles until 1957 when the Ewald Praxl-designed Prinz arrived and car production resumed after 28 years. The Prinz appeared at the Frankfurt Motor Show under the slogan ‘Drive a Prince and you’re a King’. The first models offered 23bhp with a crash gearbox, two doors and four seats, although 2 plus the occasional 2 would better describe interior space. All round independent suspension with its engine at the rear designed by Albert Roder who was largely responsible for NSU's motorcycle engines; air-cooled, overhead-cam, twin-cylinder power unit displacing 583cc. Under the hood space for a small amount of luggage shared the area with a spare wheel and fuel tank, although a small suitcase could be slid behind the rear seat. Development would increase performance to 30bhp on later examples, even so they were rather basic and when pushed more than a little ‘vocal’ this failed to deter buyers as the model became very popular within its home market. The Prinz 2 and 3 received all synchromesh gear change and additional performance. Ease of maintenance with its motorcycle derived power train meant the engine, gearbox and final drive were a single chamber, all oil lubricated via the rocker box cover. This example from 1960 was found in the Malta Classic Car collection although there is reckoned to be around 50 left in the UK. The factory continued to refine the Prinz saloon over four years and their success was increased with the attractive Prinz Sport and GT models. By the mid-60s the larger models C/TT and TTS came to market whilst their powerplants increased to four cylinders with 990cc, 1085 and finally 1177cc available. The Rotary engine RO80 arrived in 1967 and VW took control two years later and the name NSU disappeared under the Audi wings but no doubt the Prinz name will rekindle memories with some CMM readers. Let us know, if the drive was as ‘unique’ or engines decibels as ‘vocal’ as the history books suggest?